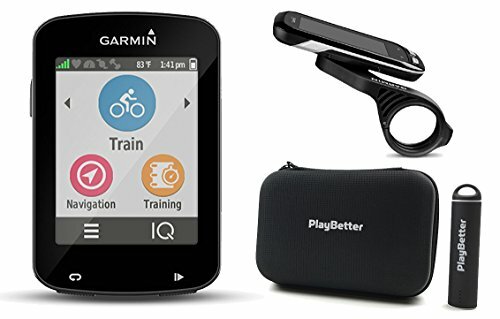 Garmin's brand new feature, GroupTrack, allows you to pair your device through Garmin Connect so you can keep tabs on your riding buddies, and they can keep tabs on you when you get separated. An ambient light sensor automatically adjusts the screen's brightness, so it's easy for you to see at a glance, and the capacitive touch display is responsive - even when wet or used with gloves. Compatible with ANT+ sensors, including speed, cadence and heart rate. For even more performance data, the 820 is also compatible with ANT+ power meters, including Vector 2, our unique pedal-based power meter that measures total power, left/right balance and cadence. Garmin Cycle Map provides you with routable road and bike paths, elevation data, points of interest and address search. You can even use round-trip routing to let Edge 820 select a cycling-friendly route for you, based on how far you want to ride, beginning to end. GROUPTRACK FEATURE & PRELOADED CYCLING ROUTES - Keep tabs on your riding buddies, and they can keep tabs on you when you get separated; you'll be able to view everyone on the map right on your Edge 820! ; Tons of pre-loaded cycling routes (road and trail) with turn-by-turn navigation! ULTIMATE ACCESSORIES BUNDLE - Keep your Edge 820 looking brand new with the PlayBetter Protective Hard Case and keep it fully charged at all times with the PlayBetter USB Portable Charger (2200mAh)!